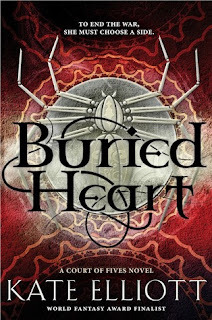 This week, my swoon is from Buried Heart by Kate Elliott! He sweeps me up int this arms and carries me through the open doors into the bedchamber. The bed stands in the center, the only object left in the room. He pushes aside the draped netting. His manner is as solemn and desperate as my own, none of the laughter and wrestling and endearing awkwardness of our other times. Because the lamp has been left on the balcony, we are left in the shadow of each other, communicating by sighs, by the tough of lips and the pressure of hands. The heart has its own speech. That is the only language and light that we need. I loved this series and I'm very happy with the conclusion. It's a great series to binge-read! OMG! I'm absolutely checking this book out!! Those last two lines are great! I'm glad this was a nice series for you. Excellent, swoon worthy indeed :) I hope I'll find the time to read this one, I'd love to see how the trilogy ends. I'm so glad you enjoyed this one! I only read Court of Fives and I really enjoyed it but for some reason I haven't felt motivated to pick up the rest of the series but maybe someday. Thanks for sharing, I hope you have a great weekend! Oh wow... that was cettainly hot... I didn't mind it one bit!